Great service at a decent price. Transfers went very well. Driver was on time and was very professional and pleasant. Would definitely use Peak again. So perhaps the Mont Blanc region of the Alps is not particularly known for its road cycling compared to its Tour de France Counterparts such as Alpe d’Huez etc. But with Saint Gervais and Megeve having just hosted the final two stages of the Critérium du Dauphiné as well as Chamonix & Morzine hosting their first ever Iron and Half-Iron distance triathlon, which is to be the toughest in the world to date. The Haut Savoie, Aosta and Valais resorts surrounding Mont Blanc have a lot of challenging and beautiful road cycling on offer! We have been speaking to our keen like-minded local lycra donning friends to find out their favourite cycle itineraries in the region. Col de la Columbiere is not only a favourite of Calton’s but has featured in the Tour de France no less than 20 times! For those of you triathlon devotees that like the sound of this. Evergreen Endurance Triathlon is the worlds most beautiful, toughest and environmentally friendly half and full iron-distance triathlon in the world. The 228 Iron distance triathlon starts with a 4km swim in the sparkling Lac de Montriond in Morzine, followed by a 181km bike race passing Col de la Columbiere via Col de Romme as mentioned previously concluding in Chamonix. Then participants embark on a 43km trail run accumulating over 7500m of ascent on their way. This combination of distance, ascent and mountain profile makes Evergreen 228 unique and grand adventure through the Alps. For those perhaps not quite ready (or brave enough) they are also holding a middle distance event the ‘Evergreen 118’ which combines a 2km swim, 95km bike and 21km trail run as well as a team relay. Evergreen Endurance’s itinerary is not its only unique feature but it’s determination to be carbon neutral by 2019 and environmentally friendly through a range of initiatives shown below. They have also pledged that any profits will go to environmental preservation projects. Entries are open until the end of August. 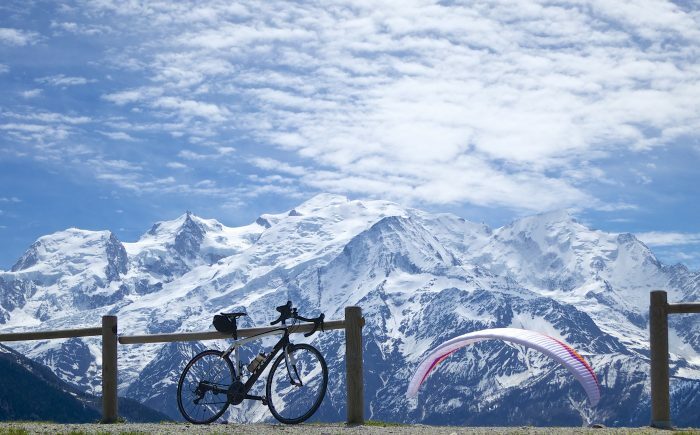 Next up we contacted ‘Will’ the author and owner of cycling-challenge.com Cycling Challenge is a cycling blog where Will details many of his cycles through out the Alps and beyond. It’s a great resource for any budding cyclist looking to hit the Alps and looking for some trusted and unbias advise on itineraries. On his blog describes Col du Grand Bernard as, “A wonderful ride on epic, very high, safe roads. Makes sense to me.” At 2,469m making it Switzerlands third highest pass, Col du Saint Bernard is no mean feat… but a beautiful one with breathtaking views (not just because your cycling up a mountain!!!) and well worth all the effort! The Col du Grand Saint Bernard and tunnel links Martigny in Switzerland to the Italian Aosta Valley. You can start your ride from either the swiss or Italain side of Mont Blanc depending on your preferences on length and scenary. Will discloses an invaluable piece of advise stating that initially the main road from the Swiss side is not the most pleasant with fast traffic and tunnels and that the ideal start point for him is where the new Alps bypass tunnel splits from the old road about 7km’s from the Col itself, but its personal preference. Saint Bernard and its surroundings are very proud of their history after which everything is named. On your way you will come across the Saint Bernard hospice where the monks breed the Saint Bernard dogs, the tribute statute to Saint Bernard the patron of mountaineers stands tall besides a beautiful lake. If you want to hit the hatric you can always go for the Col du Petit Saint Bernard to reach France. Starting in Chamonix not particular known for its road biking credentials Col des Montets is one of the smaller and shorter cols around. Linking the Chamonix Valley to Valais, Switzerland. Passing through quiet ideal villages on the way you can’t help but feel engulfed by the enormous mountain ranges either side of you. Views of the Aiguille du Tour, Chardonnet, Aiguille Verte, Aiguilles de Chamonix and Aiguille rouges and nature reserve you have plenty to look at as you switchback through the pass. If this is not enough of a challenge continuing a climb up to Lac d’Emosson will make it one, but be prepared its steep (9 – 10%). Another local favourite for paragliders, cyclists and ski tourers a like is the Plaine Joux climb from nearby Sallanches or Passy. Passing through forests, alpine villages and shall we say ‘interesting’ sculptures this definitely makes for an enjoyable climb. Well we say that, the climb ranges from a steady incline to some rather steep kicks constantly keeping you on your toes (or out of the saddle). Mont Blanc sits proudly in the backdrop as a distraction, or perhaps as a good perspective to know you are not climbing to the top of that instead! My favourite bit is probably the vast range of restaurants and cafes on route and at the Plaine Joux itself and perhaps going back down, the road are quite and recently surfaced so as smooth as you like, unusual for such quiet roads. Well except at the very top! Its less about avoiding pot holes the size of a family saloon and more about keeping to the thin line of recognisable tarmac! A good test of bike handling skills! Just a quick note: don’t mix this climb with the particularly brutal Col de Joux Plane in the Vallée Verte. Well that’s probably enough to be getting on with initially, for more detailed information including maps, profiles and .gpx files on any of these cycle itineraries and many more be sure to take a look at Will’s Cycling Challenge site, Savoie Mont Blanc Tourist Information site.